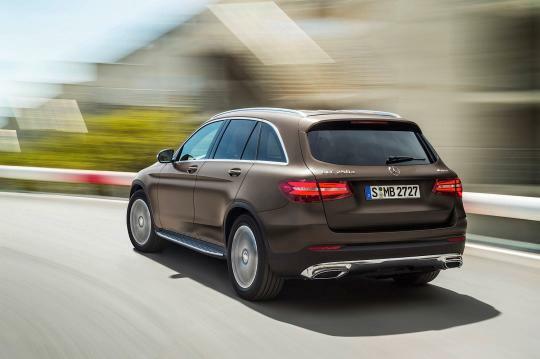 Here it is – the all-new Mercedes-Benz GLC –Class. If the GLA was too small and the GLE was too big and expensive, this should hit the sweet spot for you. The GLC replaces the GLK in the Mercedes-Benz line up. We never knew the GLK because it was only ever made in left-hand drive. But with global demand for SUVs on the rise, making the new GLC in both left- and right-hand drive was a smart choice. Next to the GLK, the GLC is 4.7 inches longer, 2.0 inches wider, and 0.3 inch taller. It rides on a wheelbase stretched by 4.6 inches, while the tracks are up by 1.9 inches in front and 0.8 inch in back. Up front, the GLC features a two-slat grille flanking a prominent three-pointed star—no stand-up hood ornament here—and as with the C-class, the headlamps can be optionally lit fully by LEDs. This Mercedes GLC has turned lighter than what we used to have. The growth spurt has yielded an additional 2.2 inches of rear legroom, 2.2 inches of front elbow and shoulder room, a tad more cargo space, and even a 1.3-inch-wider rear-door opening at foot level to facilitate ingress/egress. Even so, the use of aluminum, high- and ultra-high strength steel, and plastic render the body structure some 110 pounds lighter. If you’re hungry for more performance, you can pick the GLC 450 AMG Sport in the future. Both rear-wheel drive and 4MATIC will be available. Interestingly, left-hand drive and right-hand drive 4MATIC models will get different front to rear torque split. The more aerodynamic GLC will be powered by Mercedes 2-liter inline 4-cylinder engine producing 241 horsepower and 273 lb. ft. of torque, routed through a new nine-speed transmission.